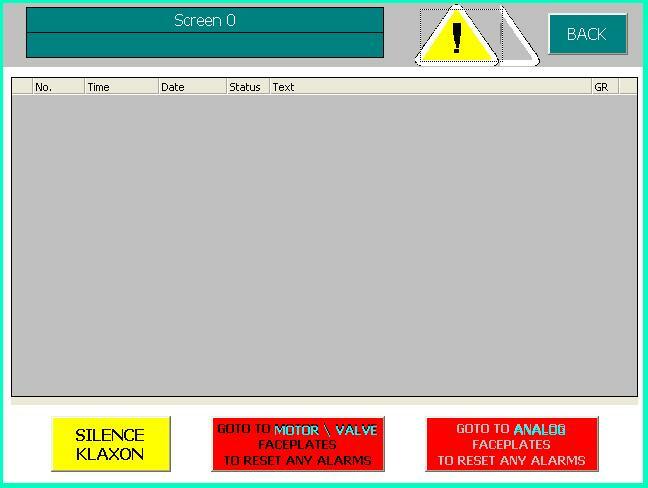 This is the Alarms Page, this is where the Klaxon is silenced - this is only place where Alarms can be Acknowledged and where the Klaxon can be silenced - this quite deliberate in forcing the user to this page ( and hopefully seeing all the alarms on the system ) before Acknowledging the current Alarm ( and Silencing the Klaxon ). The other two buttons both point to the same index page - since this is a small system it was considered easier to have just one index page. This is the index page of the Valve and Motor faceplates and the Analog Meters - all elements of the control system that can generate alarms ( and in the case of the Valve and Motors - they need resetting after alarming ).